Transcat Cat Door - White. ► Polycarbonate with magnetic catch to stop the flap from opening at will;. Easily install a dog flap in your glass or wood door or wall. ► Weather resistant flap;. ► Transparent rigid flap with magnet;. 1 Piece Cat Pet Flap Door. - This pet door for screens is designed for screened storm or patio doors, windows and any other screened areas to allow in/out access for your pet. Mark height on glass panel with tape of similar,and cut required hole out above. 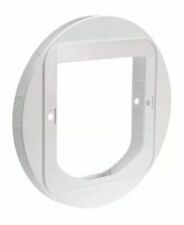 COMPATABILITY - The Installation Adaptor has been specifically designed for the PetSafe Microchip Cat Flap. 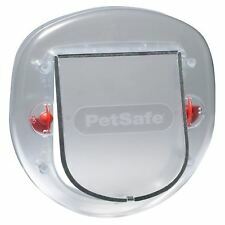 COMPATABILITY - The Installation Adaptor has been specifically designed for the PetSafe Microchip Cat Flap. 1 x Microchip Cat Flap Installation Adaptor. 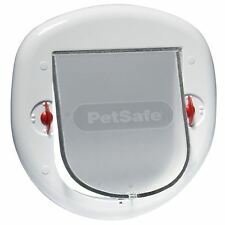 Compatible with: Microchip Cat Flap (PPA19-16145) ". 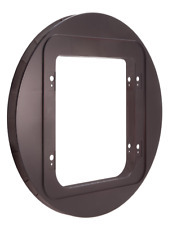 Brown Sureflap Mounting Adaptor. for use with glass doors.